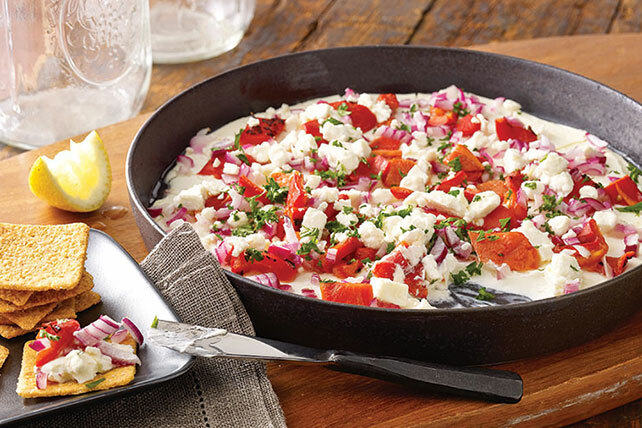 Feta cheese and a squeeze of fresh lemon give this Greek Antipasto Dip its Mediterranean flavor. For still more, add chopped kalamata or black olives. Mix reduced-fat cream cheese and garlic; spread onto bottom of 9-inch pie plate. Cover with peppers and onions. Drizzle with oil; top with feta. Bake 10 to 12 min. or until heated through. Squeeze lemon over dip. Sprinkle with parsley. Serve with crackers. Add a layer of 10 chopped kalamata or black olives to dip before baking as directed.